I wanted to write about PIncho last week when I went there for the first time. Unfortunately, the food was so delicious that I started eating and forgot to take all but a single picture, and didn't have enough for a post. Luckily, after I raved about the food to a friend of mine at the Bohnenviertelfest, she asked if I wanted to go back again this week. The food was just as delicious as the first time, and I snagged enough photos to be able to give you a better overview of one of my new favorite restaurants in Stuttgart. 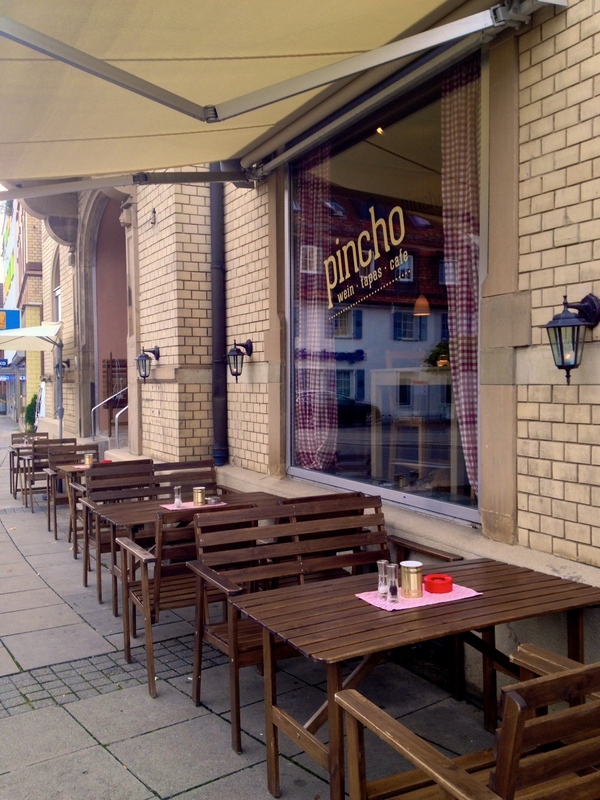 Pincho is a new offering in Degerloch just to the south of the city center. I remember being really excited a few months ago when I saw the window dressings go up announcing that Pincho would serve wine and tapas. I've been to a couple of the Spanish tapas restaurants in Stuttgart and I've been disappointed in both. It's not that I'm a great connoisseur of Spanish food, it's just that I feel like I was quite spoiled when we lived in Charlottesville and used to frequent Mas Tapas. It may sound ironic that we found amazing tapas in central Virginia, but I should explain that the restaurant was owned by a Spanish expat chef who returns to Spain every year to find fresh ingredients and ideas for his restaurant. If you're ever in Charlottesville, it's one of the restaurants that you should not miss. All this is to say that my husband and I were incredibly excited after our first visit to Pincho, because we've now found a tapas restaurant that we both enjoy. And it seems others have also made the same discovery, because when we returned last night (a Wednesday) for dinner, we weren't sure if we'd be able to find a table. Pincho does have some lovely sidewalk tables, but due to the crummy weather yesterday, it was too cold and wet to sit outside. The restaurant has two large rooms inside, but one was being taken up by a very large (20 or so people) party. That left us to the front room, and as luck would have it, a reservation had canceled and we were granted the same four-person table in the center of the front window as last week. On this second occasion, I decided to start with a cocktail. The restaurant's menu is largely populated by wine and some Spanish beers, but there are a couple of cocktails -- a Rosé Prosecco cocktail and a Caipirinha. Last night I decided to try the Caipirinha, a Brazilian cocktail made with cachaça, sugar, and lime. It was very refreshing, though an odd mix with some of the warm tapas, and so when I finished, I ordered a glass of red wine. The wine on the menu is grouped by price, so that you first choose your wine and then see which price range it falls under (or vice versa if you're on a budget). Pincho offers about a dozen wines by the glass, mostly tempranillos, merlots, and syrahs on the red end and pinot grigios and chardonnays on the white end. Apart from their house wines, you can try the wines by the glass at a 0,1L size to determine if you like the wine or not before splurging on a larger 0,2L glass. You can also order a 0,5L decanter of the house wine as well, which is nice. I particularly like how they serve their white wine in small decanters inside of a tin soup can filled with ice. Last night I had the 2012 Otonal, a tempranillo and granache blend. It was smooth and not as peppery as I expected. I much preferred the 2012 Luna Lunera tempranillo that I had on our first visit. It was light, but spicy and made for an excellent combination with the tomato sauces in our tapas dishes. Both times that I visited, Matt and I were with another couple, so we were able to try a lot of dishes from their menu. We found that it worked best to order a few dishes to start, and then order more after that depending on how hungry we still were. In fact, the waiter on both occasions left us with a menu so that we could do just that. Between two and three dishes seemed to satisfy one person depending on the size of the dish. I really liked the cheese and pinchito plates. Both were beautifully presented, and the ingredients were fresh. The salty manchego and prosciutto were particularly tasty. I also liked the addition of the fig jelly and an olive compote on the cheese plate. Of course the plates come with bread, so the spreads were lovely with the cheese or by themselves on bread. Of the toasted breads, the Serrano ham was my favorite. The combination of thin-shaved, salty ham with creamy aioli and a subtle, though unmistakable hint of garlic on top of crispy toasted bread was a harmonic mouthful of flavors. We ordered the dish to share on both visits, and I wish I'd had one all to myself on both occasions. Of particular note among the warm tapas were the Albondigas, eggplant rolls, and sliced chorizo. The basil-tomato sauce with the Albondigas was so fresh and rich, that we used most of our bread to sop it up. The eggplant rolls had a great combination of flavors, and I thought the pine nuts lended them a surprisingly nice sweetness. And despite its simplicity, I liked the chorizo (from both the warm tapas dish and in the omelette) because it was so fresh. I've discovered that there is a huge difference in taste between generic, grocery store chorizo and the fresh stuff that you can get at speciality places like the Markthalle. Pincho's chorizo was definitely of the later quality. Lastly, I would also add the Margarita omelette to my list of favorites because the fluffy eggs, soft, savory potatoes, and other vegetables was a good combination. Since I've been to Pincho twice within a week, I have no idea if their menu changes or not. However, it's not posted online, which seems like a good indicator that it might. And as much as I loved a lot of the dishes on their current menu, I'm looking forward to going back and trying more different combinations should they offer them. The restaurant is conveniently located on my way home from work, so I can imagine many good evenings here drinking wine and eating tapas in my future. If you don't live in Degerloch, then you can easily get to Pincho by taking the U6, U5, or U12 bahn from the Hauptbahnhof to the Degerloch station. From there, it's just a short four-minute walk down the main street to the restaurant on Epplestraße 30. Just be sure to call in advance for a table on the busier weekend nights. Pincho is also currently open for lunch until 2 pm on Tuesdays through Thursday. They are closed on Sundays.